The Beretta PX4 Storm was first introduced to the market by Beretta at the 2004 SHOT show. 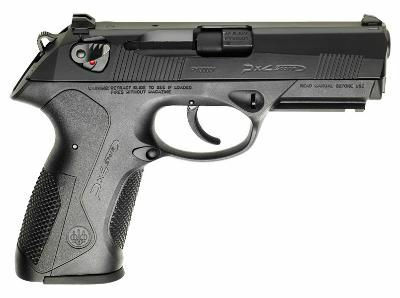 The PX4 Storm was built on the action found on the Beretta 8000 series but included the trigger system and safety system found on the venerable Beretta 92 series. The Storm was designed to target the law enforcement, CCW, and home defense markets. (1) The PX4 series was designed so several the parts were both removable and interchangeable. Those parts include the backstraps, magazine release button, slide release level, and hammer unit. The interchangeable parts system was incorporated based on user feedback stemming from the limited number of parts on the Beretta 92 that could be removed and interchanged. This was also a requirement for the handgun to be eligible for the Joint Combat Pistol program that ran from 2005 to 2006. (2) The PX4 is the first Beretta pistol to incorporate removable backstraps, and the PX4 ships with 3 different backstrap sizes including: a slim, standard, and oversized. (3) The PX4 is also the first Beretta pistol to offer an ambidextrous magazine release button that comes in 3 sizes: standard, large, or a combat version. Type G – The Type G variant operates as double or single action. This variant has a decocker but does not have a safety. Type F – The Type F variant is similar to the Type G variant in that it also operates as a single or double action pistol, but it does feature a manual safety. Type D – The Type D variant is a double action only model with a spurless hammer and no safety. Type C – The Type C variant operates in the single action only. Although Beretta calls the operation a “Constant Action”, this mode operates with the hammer in a half-cocked position, so it is not a true single action handgun. The PX4 Storm full-size models are currently offered in 9mm, .40 caliber, or .45 ACP. The PX4 full-size models are equipped with a 1913 complaint picatinny rail so accessories can be mounted. #1 – Do you offer any Beretta Px4 Compact holsters? Yes, we do carry holsters for that version of the PX4 and those holsters can be seen here: Beretta PX4 Compact Holsters. #2 – I have a full-size PX4 in .40 with a Streamlight TL7 mounted to it. Do you have a holster to fit that? Yes we can help. Any MTR holster listed below is available in a version to fit the full-size PX4 Storm with a Streamlight TLR-7 attached to it. #3 – I have a Beretta PX4 in 45 ACP. Do you make or offer a holster to fit that? As mentioned before, the Beretta PX4 full-size model is available in either a 9mm, .40, or .45 caliber version. The 9mm and .40 caliber versions will fit into a holster made for a 9mm version of the full-size PX4 Storm. However, the 45 caliber versions of the PX4 Storm full-size is larger than the 9mm or .40 caliber versions, so the 45 caliber models require their own unique holster. If you are shopping for a holster to fit a .45 caliber PX4 Storm, then try here: Beretta PX4 Storm .45. #4 – I have a kind of odd PX4 model called a PX4 Compact Carry model in 9mm. Have you heard of that and do you offer a holster to fit it? Beretta says that the slide on the Compact Carry is slightly thinner than the slide on the standard Compact? We have heard of the Beretta PX4 Compact Carry and it was introduced by Beretta in 2017. The Compact Carry was a created with input from shooting legend Ernie Landgon. It’s basically a PX4 Compact slide mated to a full size from for maximum capacity. The Compact Carry also has some upgraded features like a thinner slide (as you mentioned), better trigger, and 3 15 round magazines. We can support a holster for the Compact Carry and most any MTR Custom holster listed below is available in a version specifically made for the Beretta PX4 Compact Carry. #5 – I see that this page is supposed to be about holsters for the Beretta PX4 full-size pistols, but I don’t see a single PX4 Storm shown in any of the holster pics below? The weapons shown in the holsters below are for demonstration purposes only. The holster models listed on this page are made to fit the Beretta PX4 Storm full-size even though the PX4 Storm full-size is not pictured in any of the holster pics below. While we try to photograph as many gun/holster combinations as possible, however we do not own every single handgun model on the market. As a result, we are not able to show every possible combination. Any of the holster models shown below are available in a Beretta PX4 Storm holster version.